The handsome Mauritshuis, a monumental yet elegant residence built in classical style in 1641, serves as one of The Hague's most important museums. Highlights include a small room, or "cabinet," containing valuable objects and curios, along with numerous paintings, including Rembrandt's Anatomy Lesson, Vermeer's View of Delft, Jacob van Ruisdael's View of Haarlem and Rogier van der Weyden's Lamentation, a masterpiece of medieval painting. English language guided tours are available, and a superb app showing the museum's many masterpieces can be downloaded for free in advance of your visit. 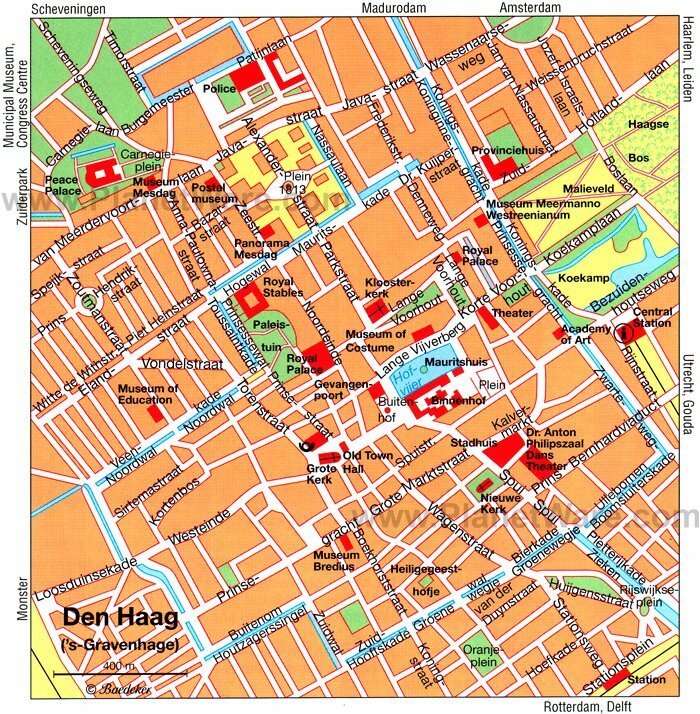 In the center of the oldest section of The Hague is the Binnenhof - the Inner Court - an irregular group of buildings constructed around a large central courtyard. With its origins dating back to 1250 and tied to the building of a castle, it soon became the residence of the ruling aristocracy, and today houses both chambers of Parliament. The most important buildings of the complex are the exquisite Ridderzaal, or Knights' Hall, which is still used for functions and receptions, and in the North Wing, the chamber is the official residence of the Prime Minister. Also important are the Rolzaal court house dating from 1511 and the Lairessezaal with its 17th-century paintings by Gerard de Lairesse. Other highlights include the First Chamber, notable for its painted medallions depicting statesmen and the portrait of King William II under the country's coat of arms. The Second Chamber - the legislative authority that watches over the government - sat in the former ballroom from 1815 until 1992. This impressive collection of the works of artist M. C. Escher is housed in the former Winter Palace of the Queen Mother Emma, a building that is itself a historic attraction. The permanent collections include around 150 original prints and lithographs, which highlight his most famous works, known for their mind-bending twists on perspective and perception. Collections also include the wood blocks and lithograph stones that Escher created his prints from, as well as examples of his early work. The museum encourages young and old to interact, offering a scavenger hunt for kids and the chance for visitors to experiment with creating their own optical illusions and tessellations. Housed in a specially made rotunda, Panorama Mesdag is a gigantic painting measuring 120 meters in length and 14 meters in height that was painted by HW Mesdag and his wife, Sientje Mesdag-Van Houten, along with other artists of the Hague School. This stunning scene depicts coastal Scheveningen as it was around 1880, with charming views of the sea, the beach, and dunes. Designed to create the illusion of 3D, this spectacular circular painting - the largest in the world - is indirectly lit from above, and thanks to its large sand dune with a number of real objects, creates the illusion that you're standing in the middle of this beautiful landscape. The building also contains a collection of paintings by Mesdag and his wife (further examples of Mesdag's work, along with other Hague School artists, is on display at the Mesdag Museum). At the east end of the Binnenhof's central courtyard, the 13th-century Knights' Hall (Ridderzaal) is a spectacular historic building still used for state receptions and the opening of parliament each September. This large Gothic hall - it measures 40 meters by 20 meters - boasts many magnificent stained-glass windows depicting the coats of arms of Dutch towns, as well as the spectacular Rose Window with the arms of the principal noble families of the Netherlands. The heavy timber roof structure with its 18-meter-long beams has the appearance of an upturned ship, and carved wooden heads symbolizing eavesdroppers from the "higher powers" are supposed to deter members of the assembly from lying. Originally built as a banqueting hall, it later served as a market, promenade, drill hall, playground, and even a hospital before being restored in 1904. Madurodam is a truly unique attraction, which tourists of any age will enjoy, best known for its extensive miniatures depicting life in the Netherlands in 1:25 scale. Visitors can wander among the various areas, each crafted in perfect detail to recreate the nation's most iconic attractions. When visiting the miniature Amsterdam, visitors can actually peek in the windows of the Rijksmuseum and see tiny reproductions of the artwork hanging on the walls. Visitors are able to walk among the models like giants, admiring iconic structures like The Peace Palace, the De Volharding building, Anne Frank's house, and St. John's Cathedral. Other attractions include interactive exhibits featuring wind power and Holland's windmills; a flight exploration center; playgrounds; and props perfect for photo-ops, like an oversized clog or giant tulips. The most unique experience here is the Fantasitron, where you can get a 3D scan, which is used to create a miniature figure of yourself. In the modern residential district of Duinoord, a garden suburb with houses built in a style influenced by traditional Dutch almshouses (hofjes), the architecturally pleasing Municipal Museum - Gemeentemuseum Den Haag - is a must-see. Designed by HP Berlage in 1935, the museum displays a wide range of material relating to the history of the town, along with 19th- and 20th-century art, applied and decorative art (including ceramics, silver, and furniture), and an outstanding collection of traditional and electronic musical instruments. Of particular note is a section dedicated to modern art with numerous works by Piet Mondriaan and Paul Klee. The Louwman Museum features the oldest collection of cars in the world, now numbered at more than 250 vehicles. The earliest model in the collection is the 1886 Benz Patent Motor Car, powered by a single cylinder and the first motor car to be patented. Other early models include rarities like the 1887 De Dion-Bouton Trepardoux Steam Quadricycle, an 1895 Buffum Four Cylinder Stanhope, and the 1897 Daimler 6-HP Twin-Cylinder Six-Seat Brake. Some of the more bizarre models include the 1910 Brooke Swan Car, a 1932 Curtiss Aerocar Land Yacht, and the 1951 Taruffi Italcorsa/TARF II. Vehicles from around the world are represented, and the newest include electric and hybrid models, as well as race cars. The famous Peace Palace (Vredespaleis), an imposing brick building constructed between 1907-13, was largely paid for by philanthropist Andrew Carnegie. Built in a mix of Gothic and Neoclassical styles, it's flanked on its long-arcaded façade with its steeply pitched roof and 80-meter-high tower. Home to the International Court of Justice, the Permanent Court of Arbitration, the Academy of International Law, and a library of international law, it boasts a rich interior décor contributed to by numerous countries, including marble from Italy, wood paneling from Brazil and the USA, and ornamental iron railings from Germany. Weekend guided tours are conducted through the palace and around the superb gardens (bookings can be made through the visitor center). The gardens surrounding the manor house at Landgoed Clingendael date back to the 16th century, creating a peaceful city oasis. The park is open year-round and is free to the public, featuring a large playground and picnic area, as well as a tearoom adjacent to the perfectly landscaped English Garden. The Japanese Garden, the most impressive part of the estate, is only open for a few weeks each spring and fall due to its fragility. It contains a variety of artifacts brought back from Japan by Lady Daisy, the former owner of the estate, who had this garden made in 1910, including stone lanterns, water casks, and tiny wooden bridges. The Scheveningen Resort area is a popular destination during the summer months with both locals and tourists. In addition to being a lovely beach area on the shores of the North Sea, this area is home to several top attractions and things to do, as well as a regular host to several festivals and concerts. Those looking for a unique way to enjoy the view will want to check out SkyView de Pier, a Ferris-wheel style observation wheel, which features gondola cars where tourists can enjoy a meal or even high tea. This sits on the water among many other attractions on this huge pier, which include a zipline, bungee-jumping, and plenty of shopping and restaurants. Another highlight of the Scheveningen area is SEA LIFE Scheveningen, an aquarium featuring a variety of ocean life, including sharks, stingrays, turtles, otters, and penguins. One of The Hague's prettiest open spaces, Haagse Bos is a two-kilometer-long expanse of parkland noted for its beautiful winding avenues. Extending all the way from the old city center to the boundary of the suburb of Wassenaar, it's a pleasant way to spend time as you explore one of the country's oldest forests, protected from deforestation since the Middle Ages. The park's most notable feature is Huis ten Bosch, a moat-surrounded palace built in 1646 as a royal country residence. Famous as the location of the world's first international peace conference in 1899, the palace is now home to King Willem-Alexander. While not open to the public, there are fine views of the building from various points around the park. Another palace worth walking around for its fine exterior views is Noordeinde Palace. The best views are from the Noordeinde Palace Gardens (admission is free), which also provides a great view of the Royal Stables, home to the horses used to pull the Royal Coaches. On the north side of the Binnenhof stands the Prison Gate (Gevangenpoort), a well-preserved structure built in 1296 as a gatehouse. Converted to a prison in the 15th century, it was here that brothers Cornelis and Johan de Witt, accused of an attempt on the life of Prince William III, were murdered in 1672 (a monument to them stands in the nearby courtyard). The old prison and torture chambers have been open to the public since the 1880s and include a large collection of paintings, prints, and relics - as well as torture devices - illustrating the administration of justice in the 17th century. English language tours are available Sundays at 2:15pm. The oldest part of the Gothic Grote of Sint-Jacobskerk (Great St. James Church) dates from the 14th century, while newer sections, including the 100-meter-high tower, were added around 1420. Unique in the Netherlands for its hexagonal form, the tower originally served as a lookout (the bell was too big for the tower and can be seen inside the church). A new carillon, one of the largest in the Netherlands with 51 bells, was installed in 1959, and can be visited as part of a tower tour (the views over the city are incredible). Highlights of the beautifully vaulted interior include numerous monuments and grave-slabs, including those of the poet and statesman Constantijn Huygens who died in 1687, and physicist and astronomer Christiaan Huygens, buried here in 1695. Other notable features are the carved wooden pulpit from 1550, the coats of arms of the Knights of the Golden Fleece, a large 19th-century organ, and the stained glass in the choir and north transept. Luxury Hotels: In the embassy quarter, steps from the swankiest shopping areas, Hilton The Hague has a 24-hour fitness center and lies within walking distance of most of the city's top sites. Hotel Des Indes, a former palace near some of The Hague's best museums, drips with historical elegance, while the pet-friendly Paleis Hotel, about 10 minutes on foot from the Binnenhof, is a popular boutique option, with friendly service and stylish rooms. Mid-Range Hotels: In a fabulous location, across the street from the Binnenhof, the boutique Hotel Corona sits at the top end of the mid-range hotels, with large rooms clad in rich, cozy hues. If you're seeking the modern comforts of a chain hotel, Mercure Hotel Den Haag Central delivers, just a short stroll from the Binnenhof, as does the Holiday Inn Express The Hague - Parliament, with clean, contemporary rooms and breakfast included. It lies minutes away from the Mauritshuis and the Escher Museum. Budget Hotels: The Ibis Den Haag City Centre, near the old City Hall and a short walk from the Binnenhof, sports a sleek, contemporary aesthetic. Breakfast is also included in the rates. A five-minute walk to the Escher Museum, the great-value easyHotel Den Haag City Centre has clean rooms and friendly staff, while the homey, family-run Staten Hotel is a ten-minute walk from the Gemeentemuseum. Just 15 kilometers northeast of The Hague is the small town of Voorschoten and delightful Duivenvoorde Castle (Kasteel Duivenvoorde), a medieval fortress restored in 1631. The original decoration and furnishings have been preserved, including family portraits, Delftware, a large collection of Chinese and European porcelain, and numerous items of silver. Also of note is the English-style park. 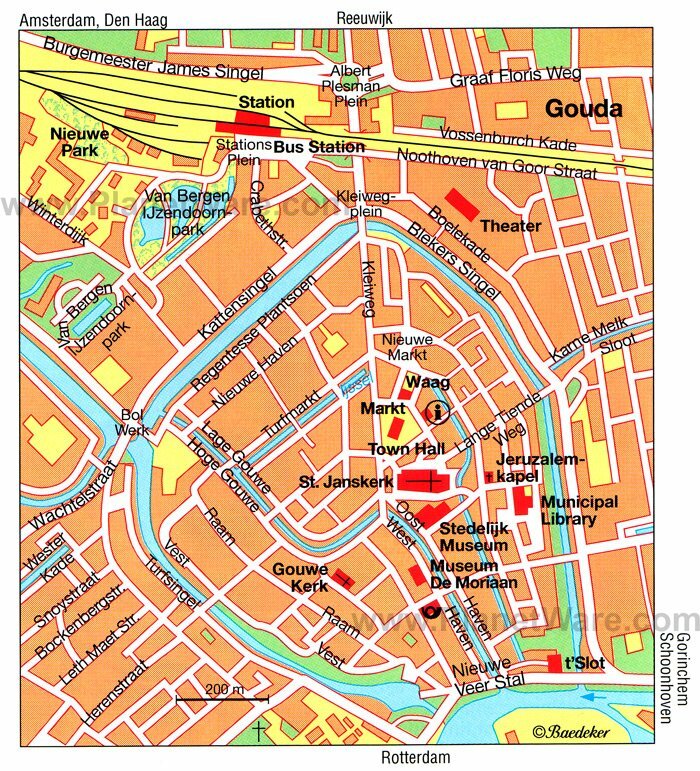 There's a lot more to the Dutch town of Gouda than its cheese. This historic town, 33 kilometers east of The Hague, has one of the most attractive town halls in the country, famous for looking more like a place of worship than of government. In the spacious triangular Markt, this imposing Late Gothic building (by Jan Keldermans, 1449-59) was originally surrounded by a moat. The handsome external staircase in Renaissance style was added in 1603. On the east wall is a carillon, which rings every half hour with moving figures representing the granting of the town's charter by Count Floris V in 1272. In the Trouwzaal (Marriage Hall), look for the 17th-century tapestry by David Rufelaer made in Gouda. Gouda's most important church is the Grote Kerk of Sint Janskerk, dating from the 15th century and one of the largest in the Netherlands. In addition to its size, its other best-known feature is its vividly colored stained glass windows, the Goudse Glazen, which include both Biblical and historical themes. The finest of the glass was the work of Wouter and Dirck Crabeth between 1555 and 1577, while the most recent window, War and Liberation, was designed by Charles Eyck in 1947. Just Outside the City: The towns just outside The Hague are minutes away and full of things to do. The university town of Leyden (Leiden) sits just to the north of the city, known for its cultural diversity and attractions like the Old Castle (Burcht van Leiden) and multiple excellent museums. South of the city on the route to Rotterdam, the picturesque town of Delft is best known for its world-famous blue Delftware ceramics; visitors can tour the De Porceleyne Fles factory and watch as each piece is hand-painted. Just a few more kilometers southeast, the country's second-largest city Rotterdam is packed full of tourist attractions, from historic buildings to excellent museums. Amsterdam and Surroundings: A one-hour drive or 35-minute train ride brings you to Amsterdam, home to some of the Netherlands' top tourist attractions. The Rijksmuseum, Van Gogh Museum, and Rembrandt House Museum hold some of the world's best artwork, and the Anne Frank House is a historic landmark that holds a museum dedicated to Anne and her experiences. In addition to its fine museums, there are plenty of other things to see and do in Amsterdam, from touring its canals to exploring its neighborhoods like the Jordaan. Among the most popular destinations in Amsterdam's surrounding area is the former seat of the Counts of Holland, the historic town of Haarlem. Here, you will find several architectural masterpieces including the Gothic Grote Kerk, Neoclassical City Hall, and the 15th-century Amsterdamse Poort.